The good ol’ days are gone when computer crackers and hackers used to focus on breaking into your desktop or servers just to prove a point. That is soon changing now that computers are living in just about every device you touch from your cell phones to you car. 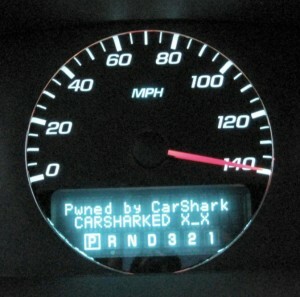 Thats exactly what the researchers at the Center for Automotive Embedded Systems Security have found that the computer system in the cars and trucks we drive are susceptible to hackers’ attacks. This was actually demonstrated by them with an experiment where without any knowledge abotu the cars, a team of experts were able to take control of the door locks, were able to disable the brakes and even shop the engine of the car. Cars today are equipped with smart computers to do the most simplest mechanical tasks such as wiping the wind shield to checking tire pressure. A typical luxury sedan has about 100 MB of code to control 50 to 70 computers inside the car, thats a lot! Researchers also compare this number to some luxury cars that have 100 million lines of code. There can be only way for preventing such a hack, is to secure your car. Hackers cannot get to your car’s computer unless they have physical access to the car. The car’s computers are usually under the dashboard so the hackers cannot get to a car if its secured. Sure this sounds safe but only to a certain point. A skilled hacker can still sneak into your car through wireless entry points such as satellite radios, automatic crash-reponse systems and others. Systems such as On-Star have the ability to remotely start or stop the engine, lock the doors etc. As more research is done on this threat, more security methods are being worked on. Physical network barriers are one way to stop a hacker move with in the car’s components. For example having a physically tripped circuit will prevent a hacker from taking control of your doors in case of an attempt. For now you can rest assured that the electronics in your car are quite alright considering you do not have James Bond style satellite devices built with in but with more cars now capable of being tracked, monitored this can be a growing concern. Previous Out of business? WebOS to replace Windows 7 in HP Slate! How did the devil start hell?